Auto Injury Lawyers at Speaks Law Firm provide free information, are available 24/7 and there is no obligation. Just call (910) 341-7570 or chat [bottom left]. Excellent law firm. They got me an excellent settlement and Jessica worked above and beyond to get it done. Highly recommend this firm.Tony C.
Thank you to Speaks Law Firm for handling two back to back cases for me! They took care of all the details so I didn’t have to worry about missing work. Two weeks after getting my car back, I was hit a second time and Speaks took care of me again. Trustworthy and efficient!Lisa F.
She actually is more than a great lawyer, she has a big heart and she cares for her clients in many ways. I've worked with at least 3 family lawyers plus legal consultations in all these years. Never seen any other lawyer like Ashley, most are not even close.C.M. The Accident Lawyers, Injury Lawyers, Workers Compensation Lawyers and Divorce Lawyers at Speaks Law Firm are available to answer your questions in several ways. You can call (910) 341-7570, "chat" (drop down or bottom right), or fill out the "Get Help Now" contact form (to the left), or order one of our free publications (below). Call us. We help injured people recover money and we help people dealing with divorce. If we can add value to your case, we will tell you. If we cannot, we will tell you that, too. In either case, we can provide reliable legal information. You can use it to make good decisions. Good decisions lead to positive outcomes. Attorney Clarke Speaks been helping people acheive positive outcomes to legal challenges since 1997. He co-authored a guidebook for the North Carolina Bar Association and written several other books. 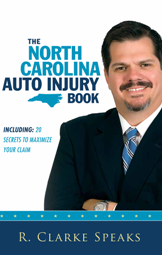 He has written a book especially for people injured in auto and other accidents in North Carolina: The North Carolina Auto Injury Book. In addition, the Speaks Law Firm produces magazines (Road to Recovery Magazine), booklets and other materials on injury law, accident law, workers compensation law and divorce and custody. These materials are available for purchase at Amazon.com or for free on this site. Please call us at (910) 341-7570 for additional information. Outside of work Attorney Clarke Speaks is a well-intentioned youth sports coach. He makes up for his limited athletic ability with great effort and enthusiasm. In spite of his athletic limitations, Clarke is an exceptional lawyer. Clarke is also the leader of a talented team of dedicated lawyers and legal professionals. This all star team includes Injury Attorneys Chris Bell, Audra Matney. It includes litigation attorneys Jessica Cornette and Garron Michael. The team includes Wilmington divorce and custody lawyer Ashley Smith. Head Paralegals Debbie Black and Abby Douglas lead the injury section. Our Front Desk Manager is Adriana Perez. Our case managers are Jennifer Garcia and Hannah Budd. Our demand writer is Matt DiGioio. Our investigator is Steve Netherland. These are experienced and caring professionals who work together to solve the legal problems our clients face. Our clients face challenges in the areas of Accidents, Injuries, Workers Compensation, and Divorce and Custody cases. Our team is dedicated to helping you get to a better place. We get to know our clients, and we care about the results we obtain for them. Each of us has a very specific set of skills that make us very effective at what we do. Outside of work, we have families, hobbies and interests just like you. To learn more about the people who have worked so hard to acheive the recognition and awards described below see About Us. The Speaks Law Firm proudly serves people throughout eastern North Carolina, including Wilmington, Fayetteville, Jacksonville, Wrightsville Beach, Carolina Beach, Bolivia, Burgaw, Whiteville, Lumberton, Leland, Shallote, New Hanover County, Pender County, Brunswick County, Columbus County, and Robeson County. The Speaks Law Firm is an award winning firm comprised of outstanding legal professionals who care deeply for our clients. 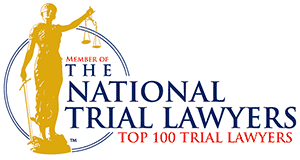 We have achieved recognition by national attorney ranking sites such as AVVO and Super Lawyers. We have represented people against the state and federal government, Fortune 500 Companies, large Universities and nearly every major insurance company operating in North Carolina, Virginia, South Carolina, Georgia, and Florida. Every client is our most important client. That has been our core philosophy since this firm was founded in 1997. We recognize that there are hundreds of lawyers you could choose to help you with these challenges. From the coast to the mountains, North Carolina is as beautiful as it is unique. Wilmington and the surrounding areas are great places to live, work, and visit, with a rich history and charming culture. Maybe you need a lawyer. Maybe you don't. But, you do need information. We can provide it. We can answer your questions and give you reliable information. With reliable information you can make good decisions. I saw your TV commercial. You said, "No FEE unless we recover." What does that mean exactly? If we are unable to recover money for your claim, you do not have to pay us any money at all for our services. If we do recover money, we deduct a percentage of it as a fee, pay medical liens and give you the rest. I was in a serious car accident. How can I find the very best lawyer for my injury claim? Auto injury attorneys work with insurance adjusters to help people who have been injured recover fair compensation. On average people recover 3.5 times more money with an attorney than without one. Attorneys are able to recover even more if they are experienced, knowledgeable, professional and effective. If you were hurt at work, then you may have a workers compensation claim. You may have one even if you were responsible in some way for your injuries. Your claim may be valuable. If you are like most people, you just want to get better and get back to work.